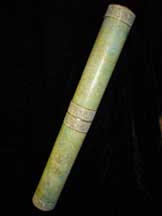 Mera of Xebel penned these spell scrolls on stained white parchment during her tenure teaching Advanced Hydromancy at the legendary magical academy of Fathomcrest, located on the island of Qurry. The scroll is kept in a case made from the spine of an orca and Mara chose to write her work in Undercommon, a language she learned from her mentor, Grim Naomi of Belgrandia. There are seven scrolls altogether, with each being over 3 feet long and all of them completely filled with her small, cramped text of waterproof green ink, milked from one of Grim Naomi's pet verge rays. • You may cast the water breathing spell. Once you cast it you must finish a short or long rest before you may do so again. • You may cast the control water spell. Once you cast it you must finish a short or long rest before you may do so again. • You may cast the watery sphere spell. Once you cast it you must finish a short or long rest before you may do so again. • You may cast the create or destroy water spell at will. • As a bonus action, before casting a cantrip or a spell, you may change it's damage type to acid damage. • You may create a long whip made from water that lashes out at your command toward a creature within 30 feet. Make a melee attack, with the finesse property, against the target. If the attack hits, the creature takes 4d8 bludgeoning damage, and if the creature is large or smaller, you may pull the creature up to 10 feet closer to you.